Crockpot freezer meals have become my go-to for busy weeknights. They’re as simple as 1-2-3. Prepare. Freeze. Dump. These crockpot recipes can be made ahead of time and frozen in a freezer bag. The meals are ready to go when you need them. Simply thaw the freezer meal in the refrigerator overnight and dump into the crock pot. As a busy mom, my crockpot is one of my most used kitchen appliances. I love the idea of having dinner slow cooking while I’m working or going between after school activities. I also use it often in the summer months as it doesn’t heat up the house like the oven does. I can often toss fresh ingredients into the crockpot in the morning, but having a few of these crockpot freezer meals already prepared is even better. I don’t have to worry about what I am cooking last minute or have to run to the grocery store to grab last minute ingredients. We’re also eating out far less as I already have the make ahead freezer meals for the crockpot prepared in plastic bags. I choose a slow cooker freezer meal from the freezer, thaw it in the fridge overnight and dump the ingredients into the crock pot in the morning. When we come home after a busy day, I know dinner has been slow cooking all day and is ready. Stay on Budget With Crockpot Freezer meals. Print recipes, make a grocery list and shop the sales. Chicken breast, chicken thighs, pork chops and ground beef go on sale a lot, you can freeze them in individual portions or 1lb servings. 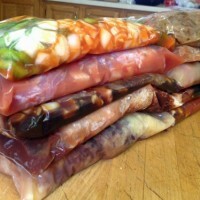 I use the fold top sandwich bags to portion out the meat, and then put them in a larger Ziploc bag to freeze in bulk. Print a calendar or make a list to help meal plan and keep track of what crockpot freezer meals you make. 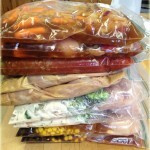 We recently used up all of freezer crockpot meals so I decided to compile a new list to try. I tried to use ingredients that we already had in the pantry or fridge/freezer, and made a grocery shopping list of ingredients that I needed to pick up. First, I separate all of the ingredients on the counter. Then, I get the meat ready – trim the fat off the chicken and cook the meat if needed. I then chop up all of the vegetables and open up the cans. I write the directions and cook time with a permanent marker on the freezer bag. If you don’t have a second set of hands to help stuff the bags, these baggy clips are great and help to keep the plastic bag open. 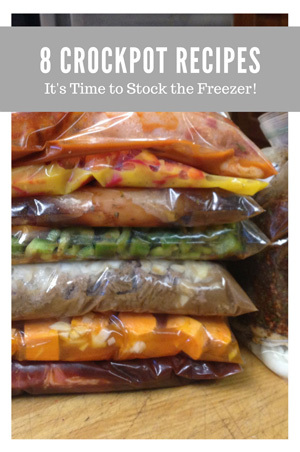 I prepare all of the crock pot freezer meals at one time and it takes between one and three hours depending on how many make ahead meals I’m preparing. You can always add in extra ingredients/change the recipe for these crock pot freezer meals to your family’s liking. These are meals and ingredients that our family enjoys. 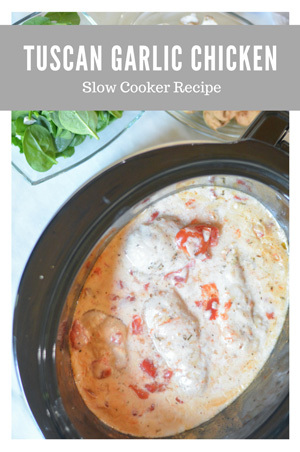 Between my husband and I’s work schedule, the 4-6 hour slow cooker meals work best for us which is what most of these crock pot recipes are, I have also always have never placed the ingredients in frozen – always thawed, so I’m not sure the cooking time if frozen. These crockpot meals are cooked for 2 adults and 2 young children (ages 3 & 5), and there is always leftovers for lunch the next day. Cooking times may vary depending on your type and size of slow cooker. Toss steak in salt, pepper, & flour and add to gallon-sized freezer bag. In a med bowl mix together the rest of the ingredients, add to bag. Zip close and place in freezer. When ready to use thaw in fridge overnight. Empty contents into crock-pot and cook on low 8 hours. Crockpot Sweet and Sour Meatballs are an easy game day appetizer. Serve on top of brown or white rice for dinner the kids will love. Place the frozen meatballs, peppers, onions & sweet and sour sauce into a gallon-sized freezer bag. Zip close & place in freezer. When ready to use thaw in fridge overnight. Empty contents into crock-pot and cook on low 4 hours, during the last hour add in the pineapple. Sprinkle salt & pepper on pork chops if desired, place in a gallon-sized freezer bag. In a small bowl mix garlic, brown sugar, soy sauce, and chicken broth together, add to bag. Place flat in freezer, when ready to use thaw in fridge overnight. Empty contents into crock-pot and cook on high 4-5 hours or low 6-7 hours. Salt & pepper chicken and place in gallon-sized freezer bag. In a medium bowl, mix together honey, soy sauce, ketchup, oil, garlic, red pepper flakes, onion, (bourbon, if using) and add to bag. Zip close and freeze. Serve over rice, sprinkle with sesame seeds. Place the roast and onion in gallon-sized freezer bag. Sprinkle in cumin, then add salsa & Ro-Tel. Zip close & place in freezer. When ready to use thaw in fridge for 24 hours. Empty contents into crock-pot and cook on low 8-10 hours. Drain juice out of crock pot, reserving some in a small bowl. Leave onions & tomatoes in crock pot. Not familiar with Ro-Tel? It is diced tomatoes mixed with green chilies & spices. You can see what it looks like here. Make sausage and peppers in the slow cooker. An easy game day recipe, or potluck. Combine all ingredients in a gallon-sized freezer bag, zip close & place in freezer. When ready to use thaw in fridge overnight. Empty contents into crock-pot and cook on low 6-8 hours. Place pork tenderloin in a gallon-sized freezer bag, in a medium bowl mix together applesauce, BBQ sauce and onion, add to bag. Zip close and freeze. When ready to use thaw in fridge overnight. Empty contents into crock-pot and cook on low 6-8 hours, or high 3-4 hours. Serve over rice or pasta. 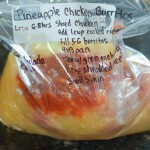 Place the chicken, pineapple, beans, and salsa in a gallon size ziplog freezer bag. Zip close and place in freezer. When ready to use thaw in fridge for 24 hours. Empty contents into crock-pot and cook on low for 6 to 8 hours. Remove the chicken and shred. Mix the chicken back into the crock pot with the rest of the ingredients. Fill 5-6 of the burrito tortillas. Place in in a 9×13 pan. Pour 1 can of the green enchilada sauce over the burritos. Top with 1 cup of the shredded cheese and place under the broiler on the middle rack until the cheese is nice and melted. About 5 minutes. Looking for an easy crockpot family dinner or a chili recipe for game day? Wow your guests with this Chicken Chili. Looking for an easy family dinner or a chili recipe for game day? Wow your guests with this Chicken Chili. Combine all of the ingredients in a gallon-sized freezer bag. Zip close and place in freezer. When ready to use thaw in fridge overnight. Empty contents into crock-pot and cook on low 4-5 hours. Remove chicken from crock pot and shred. Place chicken back in crock pot and stir. These crockpot recipes were originally found at – adapted from Apple BBQ Pork Tenderloin, Pineapple Chicken Burritos, Southwestern Chicken Chili, Pork Carnitas, Honey Bourbon Chicken, Sausage & Peppers, Savory Pepper Steak, Sweet & Sour Meatballs. I love the idea of having everything prepped and ready to put in the crockpot! Thanks for sharing…great recipes! A friend and I were just talking about doing crock pot freezer meals the other day! Their so convenient! Thank for you all these meal ideas! I especially want to try your Southwestern Chicken Chili recipe!! Yum! For the recipes with chicken, can I use already frozen chicken breasts? Hi Rebecca, yes you can. Just put them in the bag frozen. Pineapple Chicken Burritos sound wonderful to try. I never tried pineapple in recipes, but I do love it. My family would enjoy this! Wow! Saw your post today, shopped, and just made 11 meals. What a great feeling to have dinner done as we head into the holiday season. Now I can shop at the stores longer if I need too. Thanks so much! The recipes are original and different then the usual crock pot recipes. I LOVED the Apple BBQ Pork Tenderloin! Wow…I’m not a big fan of BBQ, but thought it sounded interesting so I gave it a try. Both my Mother (who basically hates all sauces!) and my boys (ages 10 & 7) absolutely loved the dish! I served it with fettuccine noodles in a butter/scampi sauce and there were NO leftovers! Everyone asked for more and we were out! I’ll make double batch next time. Pork was so tender and flavorful…a huge hit for us! Thank you and I’ve made the remaining meals, which are in my freezer ready to go! Can’t wait to try them all!! Why dirty bowls? Throw the ingredients in the bag, seal it, give it a hefty shake, and then open it to press the air out before storing flat to freeze. The thing I love about this cooking method is the work reduction. Mixing stuff in the bowl just seems to make unnecessary dirty dishes. Thank you! This is awesome! I will certainly be doing this!! Thank you so much, I absolutely love this idea if and when you have other recipes for freezer dinners please send. I have tried 2 out of 10 and it has been amazing, my kids who are 21/2&4 loved them (steak,and pork chops) tonight is pork tenderloin. Hope it is as yummy as the rest. This is absolutely brilliant (damn… why didn’t I think of it?) I will be sharing this with my friends and family for sure! What an absolutely fabulous idea! And also would make a great gift for new moms or families dealing with illness or a death. Taking the once-a-month cook & freeze to a whole new, and better, level! And will help to keep food expenses down. Thanks!!!! Yes, I put them in the bags uncooked. Unless the recipe calls for it cooked, I know I have a Beef Stroganoff Recipe that calls for cooking before placing in the the freezer bag. Not all meats go in raw, read the recipes. I know one on this site for Beef Stroganoff calls for the beef to be cooked and cooled before being added to the bag. I love this type of meal planning! I made 7 of the meals at the beginning of the week. We loved the Nacho Chicken. I served it over salad greens, crushed tortilla chips then topped it with shredded cheese. SO GOOD! The stroganoff was great, too! Tomorrow: Honey Bourbon Chicken! Thank you so much! Can not wait to try these. I clicked on the link above the new recipes to check out your original 13 I think it was but says link can’t be found. Do you have a different link or could you possibly email me them. Thank you! what a terrific idea! Many thanks. I* will be sure to try this.I love the crock pot as I am NO cook! This is a terrific idea. I think I may try this for my family, but I have one question…I have a big family…would I have to use two crock pots? Hi Katie, I have seen 8 qt crock-pots which hold quite a bit of food. I am worried my question from Nov was overlooked…it still says “awaiting moderation” while other more recent questions have been answered. Crock pot meals are prepared, frozen, then what? Do you thaw in the refrigerator and then put in the crockpot for the designated time? Or can you start cooking without thawing? Sorry if it seems stupid, I just want to be sure. Hi, in the directions I thaw all recipes overnight in the fridge, I have never cooked them frozen so I’m not sure what the timing would be. Thank you, NOW I see it! I was looking in the main text I guess…duh. Can’t wait to try these out! Thanks again. The usda says not to put frozen meat in a slow cooker. That said, if you google it, you will find that many people do it anyway, with no significant risk. I’ve only ever done this with frozen chicken, and it came out fine, and I’m still kickin. Of course, it takes longer to cook, but I put it on early enough That there’s plenty of time. Disclaimer: I am not a medical or health professional of any sort. Do this at your own risk! I have put frozen meals directly into my crockpot with no problems – except the once when the temperature difference caused the crock to crack. So excited to try these. My son is a college student and gets so tired of eating out so much. He moves into his first apt next month. I am going to make him some as well. If you have more in the future would you please email them to me ;0). Thanks !!! Do I need to use frozen or thawed pork chops for the Teriyaki Pork Chops recipe? Either fresh or frozen, I have done both multiple times. The Teriyaki Pork Chops is one of my 5 year olds favorite meals. 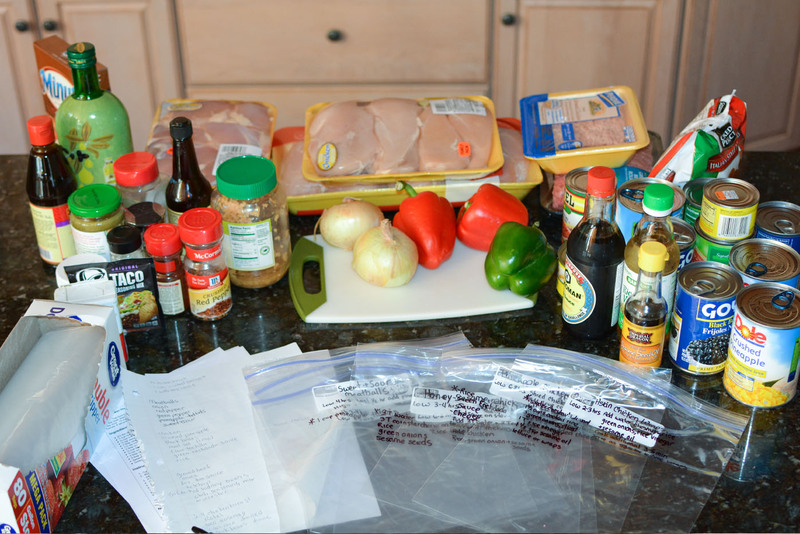 All my kids–even my picky eaters–enjoyed the Teriyaki Pork Chops. The meat was so tender at the end that it just fell apart, so it turned out more like pulled pork. I added a full cup of chicken bouillon–the juice was the best part. I ate it with my salad and didn’t need dressing. This looks great! I will check out these out for the future. Also, look into using a pressure cooker as well. As an example, I pressure cook a baked potato in five minutes, most meals in twenty. Question on some of the recipes… DO you use any liquid other than what is in the can of Ro-Tel, or a jar of salsa? Thinking specifically on the Carnitas and the Sausage and Peppers recipes. Seems like if these were to cook for 6-8 hours, it might cook off any liquid that is I a jar of salsa or a can of tomatoes… Just checking, cuz they both sound delicious and I would love to try them, but I don’t want to come home to a smoking crock pot!! No additional liquid, just had the carnitas again tonight and there was plenty of liquid to drain when I was shredding the pork. Crock pot meals require much less liquid to be added then other styles of cooking. As it’s a mostly closed container, the moisture does not cook off. With certain recipes, you may start with what appears to be not enough liquid, but at the end you’re getting nervous it may spill over the sides! A VERY important part of crock pot cooking is to NOT open the lid while cooking. That let’s out the heat and the moisture. For easier cleanup don’t forget to use Renyolds Crock-Pot Liners. They can be found in the same isle as your freezer bags. I can’t wait to try the tenderloin and the meatballs recipe next week. Thanks for sharing. Are you able to compile a grocery list of everything you need for these 10 meals? That would be extremely helpful. Thank you! I look forward to trying these. Might be a silly question, but can I make some of these fresh day off and still be ok? Does it change the high/low cooking times? What a fab idea! You can make them fresh the day of, the timing would stay the same. I always thaw the meat before putting it in the crock-pot, so it would be the same as putting it in fresh. This is exactly what I have been looking for to make mealtime easier! If only there was a printable grocery list, lol! I guess I can do that myself though =) Pinning for later! I just moved to Buffalo and as we enter the long winter this is EXACTLY what I needed. Easy fixin’s for cold days when we need to eat a hot meal and get out to the kids activities. LOVE this…thank you so much. This is my weekend project. 2 of each in the freezer! Are the fully cooked frozen meatballs the only recipe that require precooked meat? Thank you. Hi Lou, yes in these 10 recipes only the meatballs need to be cooked. A friend posted the link to this page on Facebook and hello dinner! I’ve since book marked and will be back. I use my crockpot at least once a week, so it’s nice to have some new things to try. Just wondering if you need to put water in the crock pot or just the bag it’s self thank u. Just the ingredients in the bag, no additional water. These look great. I have a crockpot that I don’t use, but I’ll be dusting it off now! I printed out a couple of recipes (avoiding all of my food allergies like pork and dairy) and will be trying them shortly! I’m looking forward to trying these recipes with “no meat” substitutes and less reliance on canned products due to high salt content. Thanks for the great idea, remember, you can also put ingredients in other containers to avoid the plastic, and be careful about cooking with plastic liners due to leaching of petro-chemicals. Why didn’t I ever think of this? awesome! First of all, WONDERFUL IDEA!! I’m a little disappointed I didn’t think of this sooner! But onto my question. How long do all of these last in the freezer? Am looking forward to trying. Thank you for sharing. Yes, that would be awesome!! I agree too that would be amazing. They all sound good, will try them. Great recipes! I was able to save a bit more time by eliminating the step mixing the sauce/spices in a bowl. I just put all ingredients in the bag and squish the bag to mix!! I hope this is not a stupid question, but co you empty the contents of the bag into the slow cooker or do you cook them in the bag? Hi Tim, you will want to empty the contents into your slow cooker, do not cook it in the bag. You could probably freeze them in those plastic crock pot liner bags and pop it right in. To make for easy clean-up you can buy the crock pot liners to use! They are in the aisle with the freezer bags. They are also cheap. You dump the food out of the bag into the crockpot. Empty the content. Let it thaw out over night in the frig first. Oh Tim. You empty the food out of the plastic bag. My other suggestion is you put the food in a crockpot liner (they have them at walmart) and then into a ziploc bag. When you are ready to cook just put the liner in the crockpot and you have easy clean up on top of easy meal prep. I this this lady is fabulous for posting this and being so much help to so many moms and dads too out there. One thing that bothers me is people expecting her to also compile their list of groceries for them. Come on people!!! She’s already done all the hard work and was nice enough to post. Can’t you do this much for yourself! She also has two young children to contend with and still did this for us. Or even better, when you make your list … POST IT HERE!!! Thanks Kate, I never thought of making a recipe list. I didn’t think people would want all 10 recipes, thought they’d pick and choose through the recipes I have on my site, and write the ingredients down that they don’t already have. My fiancé doesn’t eat beef, chicken, or pork, but does eat fish. Are there any of these recipes for fish? I don’t know if I’ll be able to find this thread again, so can you email me? Thanks!!! Gretchen,Try putting a piece of fish on top of the favorite recipe made without the meat in the last 20 minutes or so. Fish needs to be boneless and skinless, ready to eat. I have not tried this. Or just cook the fish separately and have the rest. Gretchen, I don’t think that fish would work in the crock pot since it doesn’t take very long to cook fish and the long cooking process would make it very overcooked and tough and rubbery. You might do some of the recipes in the crockpot and omit the meat then add in fish later though. You don’t need a slow cooker for fish. It would just dissolve into nothing! I would be a little concerned about cooking fish in a slow cooker – fish is generally pretty fragile and has to be handled with care. :-/ I’m not even sure it’s POSSIBLE to slow-cook fish! Anyone out there with ideas? Prepare the recipe and shorten the time in the crock pot. Add the fish later either in a baking dish or on the stove with the sauces and cook for 12-18 minutes until the fish appears flaky. Worth a try. Fish tacos are great in the crock pot. I use swai fish. Season with cumin or especias if you can find it, cilantro, butter and add onion, pepper, garlic, salt and pepper. It doesn’t take long at all either 2 hours or so. Toppings – sour cream, sheets tortilla strips, lettuce, avocado, ect. How much did this list cost you? You’re awesome for posting this! great list, thanks for putting it together. I can suggest that if you buy a larger pork roast (especially non tenderloin) you can cut your own 1inch chops from a larger roast. I pick up larger roast for much less on sale and then prep 1/2 as chops and 1/2 and roasts. Also, you can substitute boneless, skinless chicken thighs for breast meat for flavor and cost savings. Lastly, if you buy your meat only on sale like I do, you can use the same meat for all recipes and prepare more with a different meat next time for greatest cost savings and long-term variety. Thank you for sharing the compiled shopping list for the meals. Very nice of you. Glenna, whoever you are, I love you. THANK YOU for making my life easier! thanks sooo much Glenna! I was scrolling and scrolling to find a shopping list!!! You are amazing – thanks so much – going out to buy today! Thank you so much to both te original poster and you for compiling the grocery list! Thanks for doing the dirty work! This was a very thoughtful thing you have done. Thank you. For the pork chops, bone in or boneless? Thanks for the great ideas! Hi Kim, I’ve always used boneless. Thank you for making the grocery list! Very nice of you to post! Thank you for sharing the grocery list – very helpful! Glenna – thanks for sharing your grocery list. I am not a great organizer and I hate putting together list but you have just blessed me by sharing your list. I would have shopped the hard way by taking each recipe and getting the stuff – however I am blessed with a hubby who would have come to by rescue. again thanks for blessing me and others. Thank you for these wonderful new recipes! I needed some new ideas!! The shopping list is wonderful!! Thank you!!!!!!!!!!!! This is super helpful! Thanks for all the additional hard work! Much appreciated! Ya know, Kitty – you have an idea here- what an amazing gift for someone having a baby, or going through a difficult time, or I can think of a senior who would so appreciate this (provided they are crock-pot users and any allergies/diet concerns respected). Maybe not the fanciest gift – but I bet plenty of people would love it. I’m so excited to find crock pot meals that aren’t gross! Do you have a master shopping list? Brianna, see Glenna’s list above. See above 3 posts b4 yours for shopping list. What a fantastic idea. I love using my crockpot, but having the meals already preparedand ready to go in at the start of each day is just fabulous. I look forward tontrying many of your recipes the first of the year. My hope was to do a once every two week cooking and this wouod juzt be brilliant for that. Thanks so much. I hope you continue to share recipes. Thank you for sharing. I will be trying them out. Thanks so much for these. I chose 8 of them, plus your orange chicken. Made a shopping list in excel and went for it!! It took my 8 year old and I about an hour to pack up the meals, and the cost was about $100. I don’t use ziplocks, I use containers that are the same size as my crock pot. The ziplock packages don’t fit nicely, but a round container the same size as my crockpot produces a frozen “brick” of ready-to-be-cooked food that I can put in frozen in the morning, put the crockpot on a simple timer, and walk in after work to a hot meal that is mostly ready to eat! You may want to rethink this process. Typically crock pot manufacturers and many University extension food safety specialists will tell you that your food must get to a certain temperature within 2 hours. By putting frozen foods into a crock pot or slow cooker, the food sits in the danger zone too long and does not kill potentially dangerous bacteria. Notice that the original post mentions thawing overnight in the fridge so that she is putting cold food but not frozen into the slow cooker. Would hate for someone to get sick. MAOM7 – I am out of the house for more than 12 hours on workdays so we use the crock on weekends. Timer! This is truly a DUH! moment. Thank you for sharing – I will be using the crock more often! Thanks for the suggestion, I was thinking the same thing! LOVE this so so much! Our large family is going to start doing this along with my daughter and her hubby! 1 big ole shopping/prepping day as a fam 🙂 SUPER excited to try these recipes, we will be adding them to our recipe list! Thank you again! Merry Christmas from our family to yours! they all sound so yummy. I just went shopping today and I am trying the BBQ cranberry chicken tonight 😀 I am so excited to try and also looking forward to saving the headaches of trying to decide what is for dinner. as a mom of 5 and oma to 3, this could save me a lot of time, and stress, and give me more free time w my kiddos, esp. on school nites! Can pinto beans be substituted for black beans? Bummer. Every single recipe has meat in it…. :( Meat. Meat. Meat. Total bummer. I bet it would be pretty easy to make it vegetarian/vegan. Or you could always Google “meatless crock pot meals” to find what you’re looking for…. No, this is not a bummer, this is real life. Your expectation of what this website would have is unrealistic and your response is unwarranted. How about, instead: “Thanks for the recipes, is there any way to make these vegetarian?” OR: “Does anyone else know how to make vegetarian crock pot recipes?” There are better ways to find what you’re looking for than to be rude to someone who is being quite helpful and does NOT exist to please just YOU. Shame on you. Don’t despair Sarah, you can substitute a variety of vegetarian/vegan options for the meat. I’ve made many crock pot meals with just veggies and beans. A quick way to do this is to take the existing recipe and replace the same volume of meat for either tofu, veggie meat substitutes of the same type, or just vegetables. I substitute mushrooms and tofu for all the different meats. Works great. Just leave out the meat of substitute meatless products for it. Yes, Sarah, They have meat…. but be creative…. Morning star has lots of meat substitutes,.. also Firm tofu after it is frozen makes for a wonderful sub for chicken stuff. Could you substitute soy-based meat or tofu? Make it without meat then.. So either omit the meat or add whatever meatless substitute you eat to it. Simple. It wouldnt take much altering to end up with meetless recipes instead. These recipes to be a good start to your own vegetarian or vegan version…. I just made the honey bourbon chicken tonight and it was amazing!! I also made some potstickers to go with it…delish!! I am cooking the Honey Bourbon chicken now, without the.Bourbon since my mom is here. Can’t wait to try it. The teryaki pork chops were great for new year’s day and the meatballs were great for a school night. Thanks again. What a great idea! I definitely plan to try a lot of these. One quick question – I also have a 6qt oval crock-pot and it seems like some of these recipes (e.g. I saw one with 2-4 chicken breasts and a can of Ro-tel, plus some seasoning) would barely cover the bottom of the pot. I’ve always heard you should fill the crock-pot about 1/2 full or it cooks too fast or dries out. Have you had any issues with having too little in a batch? Do you do double batches? How long are they good in the freezer before they HAVE to be cooked? You are absolutely fab and look forward to looking at your other links! Wow! Great Help! Thank you! But I have to confess that I’m a little jealous I didn’t think of this when my kids were small over 30 years ago! I had a crockpot but never ever thought of doing this back then! Dah! Working full time and having to come home and think of something for dinner, this would have been a life saver! Oh well! I am passing on to my daughter for her family. Thank you so much. It is appreciated! I’m due in six weeks. I’m going to put a few of these together and store them in the freezer for after the baby comes. That way when I’m exhausted I don’t have to worry about what’s for dinner 🙂 Thank you for the recipes! This was so, so kind of you! I just had the crock pot chicken and sweet potatoes…it was delicious! I added carrots and at the last hour or so of cooking, I added regular potatoes. The chicken and sweet potatoes were very flavorful! Definitely a keeper. Can’t wait to try the savory pepper steak! I can’t cook for diddly!!! Thank you for making “Dinners for idiots” for people like me!!!! Thanks so much- these sound fabulous- can’t wait to try!! I wonder if anyone has tried these w/a meat substitute? Meat subs, work great in the chilli’s, sweet and sour meatballs, and the grilled morning star “chicken breasts” are good for the chicken ones, but I add them in for the last hour of cooking… I have never tried cooking them the entire 4-6 hour time. This is an idea that I have not yet tried. I love cooking for the family, but sometimes get behind in planning. All of these recipes sound great. I’m looking forward to the prepped meal idea. Thanks so much for posting these. Sounds great and I will try these! Thanx!! Thank you. Thank you, Thank you. I think you should be put up.for sainthood. Or at the very least, nominated for the Nobel Peace Prize because you have helped many homes avoid the what’s for dinner nightly fights. I have made 3 of these meals already and they are so tasty. It’s a different take on my favorite foods. Thanks so much for posting these as well as creating the shopping list. So going to try this. What a help for the age old question… what’s for dinner. Thanks so much and keep the recipes coming. You won’t be able to crockpot fish However, you could still prep ingredients to go with it or to flavor it. I like to use old, cleaned baby food jars to mix seasonings since it sometimes takes a lot of time to gather up herbs to season the main dish. The baby food jars have lids and can be labeled with masking tape. If you are out of the stages of baby food, Wal-Mart sells salt and pepper shakers that look like mason jars for 50 cents. In small Ziploc bags you can put melted butter seasoned salt, lemon juice, pepper and minced garlic over instant potato flakes and keep that in the freezer, for when you want to make potato crusted cod. Just dump the thawed ingredients over the fish on a cookie sheet and bake for like 15 min. You can make mashed potatoes ahead of time and freeze them,you can freeze a can of diced tomatoes, lime juice, fresh cilantro, cumin, onion powder, granulated garlic, salt, pepper, Mexican chili powder and diced green chili’s, to put over top for tex-mex fish. Make your beans ahead of time and freeze those. For vegans: Eggplant parmesan can be frozen. So can diced butternut squash (pre cooked), prepared rice,and lightly steamed veggies. The only veggies that don’t really need pre cooking is peppers and onions, which I buy in bulk, chop and put in freezer bags for countless recipe starters. I even found a company called Phillips, in the freezer section of meijers that has frozen Portobello mushrooms.You can also buy or grow fresh herbs and freeze those so they’re always on hand . You know what would be great? How about calorie count per meal. First of all, Kari, THANK YOU, THANK YOU, THANK YOU!!! I’ve made a Master Grocery List from all of 23 recipes. If anyone is interested, I’m more than happy to share with you. I made an Excel Spreadsheet of the Table of Contents of the recipes, listed alphabetically, with their corresponding URLs. That way, if you view the PDF I made of it, you can simply look at the recipe title, and then click the URL and it will take you straight to the recipe. You can view it on the PDF I made, or you can print it and take it to the grocery store with you. I’ve sorted the Master Grocery List by Food Item, as well as Recipe Title, as well as by where you will most likely find the items in the grocery store. That way, if you print it and take it with you, it will save you time. You can shop for everything on your list in one asile, and move to the next — without having to go back and forth in the grocery store to get everything. Anyhow, if anyone wants the list, let me know. My email is aprilreinhardt2@yahoo.com. And I hope this is okay with you, Kari!! these easy recipes aren’t just great for kids… I have a disability that eats away at my energy. These recipes are just what I need to keep away from microwave meals. Thanks! 1. Prior to bagging the meals, chop up all 3 red peppers , 3 green peppers, and onions. It would have saved me much time. 2. 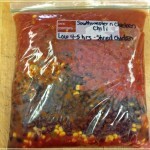 Bag the chili in 2 gallon size bags…putting it in one was super heavy and about to bust!!. Total cost for these meals was under $100 but I had quite a few of the spices/sauces at home. I can’t wait to have a freezer full of meals again. Thank you!! Just made this shopping/assembly list for your make-ahead crockpot meals. Your suggestions and these meals will help me (and my family…and my budget!) tremendously. Thank you! God bless, and Happy New Year. Burrito and chili toppings – cheese, salsa, sour cream, lettuce, avocado, etc. What a wonderful array of crockpot recipes. Thanks to the person who posted their grocery list. But I became overwhelmed at all that stuff. There are a couple of recipes I KNOW will work for my family, so I think I will make multiples of those to start with. Then as I try them, I will make multiples of one or two/day til I get a stockpile. Thanks again! I make lentil soup in crock pot & chili too – so easy and delicious. Also, sauerkraut & apples with pork tenderloin – is a favorite. After reading your crock pot meals, I had to send you my favorite one – this can be adjusted to how many people you are serving or just one -works anyway!! CHICKEN FIESTA – CROCK POT!! Put in the bottom of the crock pot – drain & add: 1 can black beans, 1 can corn (mexican corn works too), and a jar of salsa (you determine how hot you want it ). WHen you get home, add some grated cheese to slightly melt…serve as is OR, I like to make rice to serve over…and then add what ever toppings you like – sour cream – avacados – chopped green onions…you decide!!! This is really a great dinner and left overs are great too!! Take some to work and listen to your co-workers sniffing around trying to find “what’s cooking”!!! I have got the southwest chicken chili in the crock pot right now and my house smells so good! I omitted the ranch just because that didn’t sound good to me, and only put in 2 cans of the tomatoes. Next time I will drain the corn as it seems a little more liquidy than I would like, but serving over rice should help.If you cube the chicken you really don’t need a ton – I used 1 large breast and I think it will be plenty for 4 people. Can’t wait to try more of these recipes! Thanks for posting them! So very nice of you to share these ideas. I will be trying some of them. I love the idea! wow this is amazing thank you for your time making al of these recepes. When I make mine I will also make a batch for my son who has 3 boys and are in every sport! beats eating at the games thank you again. Going on our yearly vacation to Cape Cod this summer… spending a week at the beach looking forward to taking a few of these meals with us, makes dinner a whole lot easier. Thank you for this I’ve made three of them already and are in the freezer I can’t wait to eat them! I already had meat pulled out or I would have tried it already:) love how u put the whole shopping list up! My suggestion is to write the contents on the bottom of the bag so that it can be read while still in the stack in the freezer. I loving husband bought me a Wolfegang Puck pressure cooker for Christmas! All of these recipes can work in it and done in 30 minutes or less if thawed already! Wahoo you have to get one! Yum. I’m trying all of these!!! I wish I would have had these last week. I have been ill since Friday. They sound delicious and I will be making them as soon as the little germs leave me alone and find another body who is well. I ache all over, have a sore throat, and get light headed when ever I get up to a standing position. Thank you so much for sharing these recipes! I’ve been a long-time crockpot user, and I shared this page with my 23 yo son who just moved out. He is more likely to prepare these recipes and put them in the freezer for later use! wow. just wow. this beats all the busy mommy menu blogs out there! I mean, wow. I put all ten recipes together today in less than 2 hours. I’m super excited to try them out and broaden my family’s menu not to mention saving time and being prepared thank you SO much for sharing these ! Thank you so much for taking the time to do this for us. I hate trying to think of meals and then shopping for the ingredients. You made it very easy. I am trying to lose weight this year and when I don’t have anything planned I pig out on all the wrong foods just because it’s easy. Hopefully this will help me. Again, many thanks and Happy, Healthy New Year. I travel for work and plan on leaving a couple of these for my husband to make while I’m gone. He loved the idea of coming home to a cooked meal. Love all these great meals you put together! Can’t wait to try them…I’m going to do mine tomorrow. Thank you for taking the time to do this for everyone to benifit from. Would anyone know the serving sizes? In going to do this for just myself and tracking it on weight watchers. I just don’t want to over eat. I fixed the honey bourbon chicken yesterday. My daughter said “This is my favorite chicken that you’ve ever made” Score! Southwestern chili is in the crock for today..perfect for these freezing temps. Thank you! Thanks for this! Looks like one of the best I’ve seen and ty to whomever created the shopping list! Making the cranberry chicken for this afternoon before work. Can’t wait to see how it turns out, and try these other delicious recipes! We have a 7 year old whom cannot have anything with gluten and these all seem to be things she can eat! Easy and safe for her is wonderful! It’s so hard to come up with different things to feed her that don’t cost us an arm and a leg. Thank you, Thank you, Thank you!! I love all of these ideas. Quick question. Can I use chicken already frozen like from costco? Or is it better to use fresh so you can cut into smaller strips when freezing? Thanks so much! You can use frozen, just make sure it doesn’t thaw out and then re-freeze. You can prep all the bags then add in the chicken last so that it doesn’t thaw out, and place it right back in the freezer. Has anyone tried putting the meals into the crockpot frozen? By the time my husband gets home it’s 8.5-9 hrs after the crock pot was started, I don’t want to overcook the dinners! Thanks for sharing these! Hello Mommas, Dads, and everyone else. I wanted to address comments in particular that make mention of different types of meat or rather that there is a lack of plant-based protein options in this list. Slow cookers are very forgiving with many ingredients, and your protein source is no exception. Leave out the meat if you need and replace it with firm tofu, beans, and lentils (most legumes can be substituted for one another or you can create a new taste/flavor in choosing to do so). As a side note, and as recommendation from a registered dietitian, I would like to encourage those avoiding animal protein for health reasons to reconsider and instead purchase your animal protein from local farmer’s market where you can often acquire grass-fed, hormone-free, and humanely slaughtered meat. Many people choose to eliminate animal protein in their diets due to all the processing involved with store-bought products that we forget about farmer’s markets that are finally starting to get recognition. Buy/support local! And yes, pregnant woman can get plenty of iron from prenatal vitamins and additional iron supplements as ordered/recommended by their OB, but it has been well documented and supported by medical professionals (both MDs and RDs alike) that the heme iron present in animal protein is better absorbed in the gut than non-heme iron which is present in plant proteins and eggs. If you choose to stay with plant-based proteins, that is your personal choice and right – please, then also consider including a side dish that contains vitamin C, as this will aid in increasing the absorption of non-heme iron (in plant-based proteins). This is a gem of a post; really just fantastic! As another time saver, if you have a KitchenAid mixer, you can shred your cooked meat using the paddle attachment. Throw the meat in to the bowl and mix on med-low to medium for about 30 secs or less. Awesome idea, we love to go camping (or my husband says “RVing”. This will make meal planning a lot easier! Does anyone have any more recipes? I usually do not use my crock pot because the meals usually don’t turn out that good. 🙁 But I am willing to try again. Also this would be a great idea to share with families who you want to prepare a meal for if they have had sickness, babies, or the loss of a loved one. This one be great to have in freezer ready to prepare. Can’t wait to try these out. thank you so much for sharing and blessings all these people who have left comments. Also I am going to share with my co-workers should they want a copy of these recipes. Have wonderful and abundance of blessings for the New Year. My 3 toddlers are all sick with the flu and I wondered if you had a great crock pot recipe for chicken noodle soup? I read this the other day and found something that said that it cost 220.00 some odd dollars to buy all the groceries and the steps in doing this in 4 hours. I can’t find this now. Does anyone know where that went? Or was I on another site and can’t remember. I want to try this today. Thanks. This is a great find for every house. Does anyone know of a way to get the nutritional information for the recipes? I definitely will be trying these. 9 years ago when I had my youngest daughter and had 4 older teen kids i doubled recipes and froze one thinking I may not want to cook as much. When she was born I had 7 casseroles in the freezer and we ended up in NICU 7 days. What a blessing. Bu learned that egg noodles DO NOT freeze well. They become mush. Great idea. What could be easier than your recipe for Crock Pot Sweet & sour Meatballs. I recently purchase some frozen meatballs on clearance at my grocery store. -wish they would have had more than bags available. I like the frozen meatballs. These meals look and sound amazing. I love that they are made ahead of time and just put in your crockpot when ready to eat. I’m definitely going to try the Savory Pepper Steak. We just had the Savory Pepper Steak the other day. It was great. Even had grinders with the leftovers. Yummy!! I cant wait to try these recipes its so much easier to have things ready to go into the pot. Plus while they are in the bags the meat picks up all the flavors from the spices. Then cooking it slowly will definetly bring out the flavors. Awesome! I saw this posted randomly on FB and decided to give it a shot. I prepped all 10 meals at once and now am good to go. I rarely cook so this a great do-able list of ingredients. I bought frozen packs of a green pepper, red pepper, yellow pepper, onion mix so this reduced prep time for me. May need an extra onion or two in case you want more. Good stuff! Thanks! Would love to get more ideas- these sound wonderfu! Thank you for sharing… Looking forward to trying these recipes.. Love the Tupperware Vent n Serves you are using.. :).. I will use my freezer mates to freeze and also vent n serves for these great recipes… thanks again.. Looking forward to having something new to make. Recipes are delicious! Genius idea for busy moms on the go! A note on the Pepper Steak recipe- I would go with 1/4 tsp pepper, 1/2 tsp is too much. It overpowers the flavor of everything else. Otherwise amazing! Thanks again for sharing! Can someone please make a grocery list that has all the meats together, all vegies together etc? Also, I shop at Krogers so if you could put the list in order of the way that Krogers has their store laid out that would be great! Thanks in advance! I am going in for surgery in Feb. and my husband doesn’t cook at all. This will be a big help to both of us. I can just pop one in the crock pot and he can serve it when he gets home. Thanks much. Anyone else just throw their stuff in frozen? My hubby and I do that all the time and get a great result every time. I just haven’t tried combining everything first and freezing it. Any thoughts? I think this is a great idea…would make a great book! It got me to try using my nook to read the recipe as I made it (still haven’t learned to print from it) I wish had had this when kids were little and I was a working mom…but they are great for now as at 62 i am disabled with ra and often son and hubby have to fend for themselves for meals…so on a good day I started making some to put in freezer will make supper so much easier for them !thank you so much! I made the southwest chicken chili last night – it was delicious and even my kids raved about it!! I used barley instead of rice – tip for moms and dads, kids really love the barley. Thank you for posting these wonderful and EASY recipes!! This maybe a stupid question but i am new at crock pot cooking. Do you need to cut the meats into pieces or do you just cook it whole? Like the pork tenderloin or the chicken breasts? Hi Wendy, I place them in whole. Have to try one of these yum!! I have tried both the Savory Peppered Steak and the Southwest Chicken Chili. Both were excellent! I made the steak recipe because I was specifically looking for a recipe I could utilize venison that is hogging my freezer space. It made the meat taste like beef! The chicken chili recipe I substituted one of the cans of diced tomatoes for a can of Rotel. I am excited to try more of these. Thank you for sharing! The Southwestern Chicken Chili and the BBQ Cranberry Chicken are incredible! Both easy and delicious. I only cook for myself and my daughter. The chili recipe made a lot so I divided it into two. I still have plenty left over to eat myself or to share. Wonderful recipes! Keep them coming! Just have to say I made the Southwest Chicken Chili this week and it was fantastic! Trying the pork teriyaki pork chops tomorrow and the bourbon chicken next week. Can’t wait! Made 8 meals……so far all were amazing!!!!! Can’t wait to try these out this week! These look great! Do you have a printable page so I can print all at once vs. one at a time (and one-per-page)? My husband is in the Army and we will be making our 5th move in a couple of months. The worst part of moving – for me at least – is having to prepare supper for us with limited household items, in a hotel, for an extended period of time when we are waiting for housing OR we are in our new house but are waiting on our household items to arrive from our last duty station. So it’ll be nice to be able to eat actual food while living in a hotel with a tiny “kitchen” that, more-than-likely, doesn’t have an oven – just a tiny stove top (if we are lucky) and microwave (and in our house while waiting on our stuff). Instead of spending a ton of money on immediate groceries (sandwich stuff, chips, rotisserie chicken, etc.) and eating out a lot, the plan is to use these in hopes that we aren’t so tempted to order in/eat out for the ease and convenience! Hey! These meals were excellent when we were stationed in San Diego and had to stay in the hotels. My husband and I were so tired of eating out. I went and bought a crockpot the day I found these meals. It was delicious and very helpful. Good Luck! Do you have to thaw it, or can I put it in frozen? I have always thawed the ingredients. No additional water is needed. This is my son’s favorite recipe. LOVE ALL of these! Delicious! Thank you so much for posting these. You have saved my life! The last thing I wanted to do after a long day of work was cook.. My husband thanks you too! Keep em’ coming! Our church womens group has done meals like these. Its a great social time putting the meals together. They are great to have on hand if you want to provide a meal for some one. Thanks so much for some new meals. I decided to give once a month meal prep a try and utilized 21 your 23 (made some duplicates) and we now have a freezer jammed full of meals for the entire month. As a full time student with a 3/4 time job and two little boys at home (plus their big daddy!) I am always looking for ways to “buy” more time. I cannot wait to see how well these turn out. I was amazed at the fact that the prep only took me 4 hours, including cleanup but excluding shopping. It was a full day dedicated to feeding my family, but by my calculations this should save me hours upon hours throughout the month. We had the sweet and sour meatballs and loved it!!!! Thank you for all of these recipes. I have made the Cranberry BBQ Chicken and it was amazing. Tonight we are having the Terriyaki porkchops and tomorrw the Steak and Peppers. I also plan on making the Bourbon Honey Chicken. Thank you for posting and sharing. I am also sharing these with my teacher friends. This might be a dumb question but I just realized my crock pot is 4.5 quarts and yours is 6. Would your recipes fit or will I have to cut them down? I haven’t actually assembled any yet (but bought all of the ingredients) so not sure how much this really makes. Would hate to pull them out of the fridge and realize only 3/4 fits! Hi Kay, I still have plenty of room in our 6 qt after I put all the ingredients in, but I don’t have a 4.5 qt so I’m not too sure. Has anyone else tried with a 4.5 qt? Slow cookers don’t heat food fast enough so that you’d be able to throw in frozen food into a slow cooker safely. The frozen food would be in the “danger zone” too long and you may make your family sick. These recipes all sound great! I can’t wait to try them & share them! I put these together last night, and the hardest part was….chopping the onion! lol I could not believe how fast these came together! oh and when i was preparing the teriyaki pork chops i split the soy sauce all over me but that was the only con. I’ve tried the sweet/sour meatballs … very good!! I did substitute the sweet/sour sauce with a jar of Hawaiian marinade because I had that on hand. Trying Teriyaki pork chops tonight. Looking forward to making a day of preparing them all for the freezer. What a nice gift idea for someone! Thank you so much for doing all the work and sharing!! I made the Crock Pot Teriyaki Pork Chops today. They were a huge hit with the whole family. They were so tender, all we needed was a fork. And how brave am I to invite my Mother In Law to dinner when trying a new recipe for the first time? Thank you! This will go into our regular dinner rotation. We are expecting our 2nd baby next week. I wanted to make some freezer meals. These recipes seem yummy. I loved the idea of prep only, no cooking before hand. 2 days ago, I went shopping for the ingredients. Thank you for posting the shopping list (in earlier comments). It was complete. Yesterday, I packaged all 10 meals. It took 6.5 hours in total, including the shopping time ( I am 9 months pregnant, and this was my 1st time prepping 10 meals in a row)… My kitchen was a huge mess, but this is a one time mess, and my husband cleaned it up. It cost us $140 in ingredients (some items we had in the cupboard already, the meats were purchased on special, the cans were full priced. $14 a meal for 3-4 people, pretty good. The recipes smelled really yummy. It was easy to assemble. I cannot wait to try them. After my c section, I will not be able to function for a while, and I have a toddler to raise as well. Love this idea. Many thanks to the person who made the shopping list in the comments above. I tried the Savory Pepper Steak recipe and it was delicious! 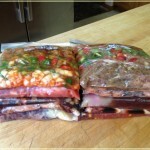 QUESTION: For the Sausage & Peppers recipe – What kind of Sausage (12 oz. package of what?) Raw or precooked? Love these recipes and thanks to the commenter who made the shopping list! What kind of sausage do you use in the Sausage & Peppers recipe? Raw, or pre-cooked? If raw, what type? I used a Johnsonville precooked since it’s something we already had in our fridge. I made the pork carnitatas wednesday and they were AWESOME… even without the salsa because some of my kids don’t like salsa…. Added a little garlic and wahla… it was yummy and all have leftovers!!!! Hi! Thank you so much for sharing these. I have a question – do you think you could put these into the crock pot frozen? I ask b/c I’ll be out of town and thought I’d make them for my husband. He leaves for work at 7am and won’t return home until 6:30pm. I was thinking he could just put them in frozen so it wouldn’t overcook since he’ll be gone longer than the recommended cook times. What are your thoughts? Hi Jennifer, I have always put them in frozen so I’m not sure. Recipes look great, a shopping list and I’d be in heaven! I tried the Honey Bourbon chicken. Wow! It was so good. We loved it. I’m gonna try more of these recipes. My (Irish / meat and potatoes) husband says the savory pepper steak is the best thing I have ever made in the 8 years we’ve been together! Thanks for posting these! Thank you for the recipes. I just now made these first 10 that were listed and will start using them tomorrow. It will be easy to make this a habit for sure on a day off make up 10 of them and have easy recipes and something different instead of having to figure out meals. Thank you again. This is a great idea if you know someone who is elderly. 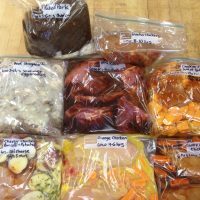 My elderly parents have a crock pot so I make a bunch of these meals, freeze them, bring them to their house and pop them into their freezer with the cooking instructions and name of the dish right on the ziplock freezer bag. Would also be a great idea to do if you know a care taker that is recuperating from a surgery or chemo, who needs to feed their family. I recently made the Teriyaki pork chops — they were great– and then used that recipe last night, substituting chicken breasts for pork chops — also delicious! Can’t wait to try a few more of the recipes posted here and to get some freezer bags ready! So far, so GREAT!!!! I have prepared most of these meals and have cooked 4 of them. Here is my take on the ones I have made: Orange Chicken – The flavor was not a strong orange taste, but it was very good. The chicken was tender and the carrots were a nice accompaniment. If you are thinking of the orange chicken that you would get in a Chinese food restaurant, this is nothing like that, so you will probably be disappointed. I used chicken thighs, I just de-boned and skinned them. Sweet and Sour Meatballs – I LOVED, LOVED this recipe, my family….not so much. I think it was the fact that this was rather on the tart side. I did not use the frozen meatballs, I made my own and it worked out just as well. Also, I used the LaChoy duck sauce which might account for it being on the tart side. I also used fresh pineapple. I served this over wide egg noodles. Black Bean Corn Salsa Chicken – I am not a spicy food person, but this was very good. I have never made a dish with beans before, so I was apprehensive. This had a great flavor. Served over rice. Crock-pot Sausage & Pepper – This was also very good. Nice flavor. Mine was a bit on the greasy side, not sure if that has something to do with the type of sausage I purchased. Also, next time I would cut the sausage into bigger pieces, but that is just me. Overall, it was good and I served it over rice. Next up, Savory Pepper Steak, probably Saturday. I will update after that. Thank you so much for putting this together. This has been such a blessing to me and has really made meal planning so much easier. I made the Sweet & Sour Meatballs tonight and they were delicious! Thanks for sharing! I have tried 3 of these recipes so far and am getting ready to prepare 3 more. Working 2 jobs and volunteering Girl Scouts and Dextination Imagination, these are great to prepare on a weekend and then take out when needed. Have loved the ones we tried so far. Cann’t wait to try more!!!! Has anyone used these recipes and cooked in crockpot longer than 6-7 hours etc? I am usually gone for 10 hours. These all sound really good. I plan on making a set for me and my husband and another for my son and his family. Thanks. I think you are an answer to my prayers.. I am a working mom with 4 boys under the age of 8. I hate the fact that we get about one homemade meal a week and sometimes that meal is frozen fish sticks and frozen veggies. I made 11 meals last Sunday in 4 hours. 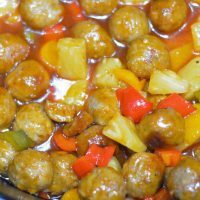 We have tried the Sweet and Sour meatballs and my husband loved them. We tried the beef stroganoff and my husband and the boys and I loved it. Last night we had the Nacho Chicken and my husband was THRILLED with the taste. I also made the Apple BBQ pork tenderloin and it was SOOO good. I can’t wait to try making some more meals… Thank you Thank you THANK YOU from my whole family! The Pork Carnitas were AMAZING. If you don’t like spicy, be sure to get mild salsa and RoTel. 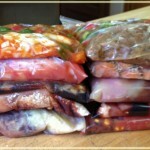 For your Crock Pot Sausage & Peppers recipe what type of sausage did you use? Also do you have any recipes for Polska Kebasa Sausage (I probably spelled that wrong. Sorry.) Recipes for crock pot or otherwise. I am excited to try all of these recipes they sound great. So glad I found your website. I love to use my crock pot however I have never had any good recipes so it usually just sits in the cabinet. I really love the fact you can prepare these recipes ahead of time and freeze them. You are amazing please keep the recipes coming. Twist low sodium and sugar free. Tasted awesome. !!! Great idea! I will be doing this soon but was wondering if you have a shopping list for these meals? It would really be helpful. Thank you! I’ve made a shopping list of ALL ingredients. I put them into an Excel spreadsheet and then created three tabs sorted by Recipe Name, by Food Item, and by where you might find the food item in the Grocery Store. If anyone wants the lists, email me at aprilreinhardt2@yahoo.com. I’ve included a table of contents that gives full rights to Kari. Her name and link-back to her site here are included on each list. I made all ten of these in one pretty easy session. I love having them in the freezer ready to go. We tried the meatball one already and will be making it again. Thanks! Last years comments someone had posted a shopping list. The link to Older Comments is a dead link. Could someone re-post the shopping list? I love my crockpot and use it all the time. But I’m disappointed that all ten of these recipes are meat-based. There are so many hearty vegetable-based crockpot recipes. I was hoping to find a new recipe here. The honey bourbon chicken (without bourbon) was very good. Everyone ate it which is big for my family with 3 kids 4 – 9. The only thing I would say is that it was pretty salty. Perhaps a lower sodium soy sauce or less of it would have helped. I also had to add 3 tbsp. of cornstarch to get the sauce to thicken up. We also had the apple BBQ pork tenderloin which everyone enjoyed. Have not yet made the pineapple chicken burritos which I’m sure will be good too. Thanks! My recipe for Honey Sesame Chicken, that I have used for a couple of years, calls for 4 teaspoon cornstarch and 6 tablespoons of water mixed together to thicken the sauce. What an awesome list! Thanks for sharing! I, too, created a shopping list of all of the ingredients. I’ve made a shopping list of ALL ingredients. I put them into an Excel spreadsheet and then created three tabs sorted by Recipe Name, by Food Item, and by where you might find the food item in the Grocery Store. If anyone wants the lists, email me at aprilreinhardt2@yahoo.com. I’ve included a table of contents that gives full rights to Kari. Her name and link-back to her site here are included on each list. Hello April, I would love you Excel spreadsheet list. Are there any vegan options ? I noticed all the recipes had meat in them. Just had the pepper steak. Fabulous! Good thing since I bought meat at Costco and made three packages of it. Just curious if anyone has made the sausage and peppers? I put it together but I used a “raw” sausage. I know even smoked sausage is basically cooked. Is it ok to use raw? Or should I just up the cooking time? Thanks in advance for any info! Just wanted to confirm thats the list for all ingredients for the 10 crockpot freezer meals? Thank you. For the teriyaki pork chips, do you use bone-in or boneless? Also, for the cranberry BBQ chicken, do you shred it? Every time I make chicken in my crock pot, it gets so tender, it almost shreds itself! I am going to give the Crock Pot Teriyaki Pork Chops and Crock Pot Sausage & Peppers a test drive this week. Thanks for sharing, btw I found this blog post in the top three with a Google Search I did looking for crock pot meals for large families! Thanks for sharing these recipes to help make other families lives easier! I just wanted to thank you for posting all of these wonderful freezer crock pot meal recipes. I now keep in stock in our freezer a rotation of our favourites. It has saved me so much time during the week – time that I now get to spend with my daughter and husband instead of standing in the kitchen for an hour every evening cooking dinner for all of us. Thank You! We don’t eat much Pork, on rare occasion, however as I looked over the Teriyaki Pork chop recipe I was wondering if you have ever tried it with chicken instead? If you look under the heading 23-Easy Crock Pot Freezer Meals there is actually one for Chicken Teriyaki. I am actually having that one for dinner tonight. First time for this one. I made a slight modification, I used 1 20 oz can of crushed pineapple and 1 20 ox can of pineapple chunks. I did use chicken and we liked it just fine. I have not used the pork Teriyaki on the pork but there are others on here for chicken that have been wonderful! Made nine of these today. Great ingredient list ! Made it so simple. I used the juice drained from Pork Carnitas with minute rice rice for awesome Spanish rice. Thank you so much for these fabulous meals! For the last two or three Christmases I have made 5 – 6 freezer crock meals for my family as gifts. They love it! Easy and relatively cheap for me and huge bonus for busy families. What a fabulous idea! I am going to do that for next Xmas. Also a great “just because” gift for underemployed/unemployed families in our local community. Would be a great community service project. Thank you so much for sharing these recipes! We have been dining our way through the list and had Savory Pepper Steak tonight … Another winner! Absolutely delicious. We’ve been enjoying them as family night meals each week. Looking forward to trying the rest! I thought peppers, onions and veggies in general had to be blanched before freezing. ..is that not the case? Thanks so much for these great recipes! I thought you might like to know how a group of 5 friends and I are using them. On the first weekend of each month, each one of us picks one (unique) crock-pot recipe and prepares 6, gallon-sized, freezer bags worth. Then, on the following Monday, we get together for an exchange and each one of us goes home to stock our freezer with 6 different meals to enjoy during the month. It’s a great system – making 6 bags of one meal is so much easier than preparing 6 different meals. And, as working women, we love the convenience of having one or two of these meals ready-to-go each week! Please feel free to pass along this idea, if you think it would appeal to your readers. And, thanks again for the wonderful recipes! I love all the ideas you’ve posted…..and they would work great for me when I’m home . 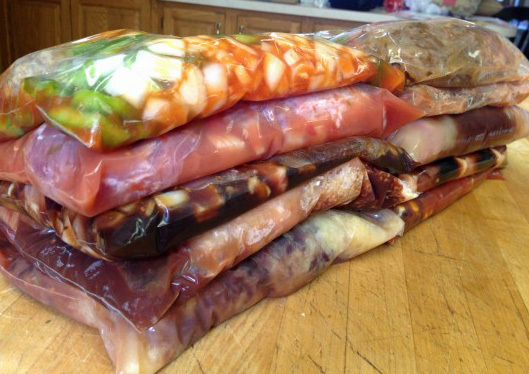 My question is: Can I make the same recipe’s above….pre-cook them…..cool then put in freezer bags and freeze flat so they are stackable? The reason I’m asking is that’s what I’d like to do and them put in freezer of RV for camping…. or would the freezing and thawing damage the recipe? I look forward to hearing from someone that can help me with this. Thank you in advance for you time and trouble in this matter. Although I’m not the author of these recipes, I don’t see how freezing after cooking would negatively impact most of them…anything with dairy and/or potatoes can sometimes be tricky. If you want to save yourself an extra step, after cooking I would pour into those dispoable foil type pans, freeze and you can transfer directly from your freezer to oven in the rv. Someone had posted a list of all the ingredients together that are required for all of these recipes. Could you repost it again? I love your recipes. This is going to be such a time saver for me in the long run. Do you happen to have the shopping list for all of these? We put together 5 batches of meatballs yesterday. If you have a GFS store in your area, one 5 lb bag of frozen meatballs & two 50 oz cans of sweet & sour sauce are PERFECT for that quantity. My fiance chopped peppers & divided meatballs while I chopped onions & measured out sauce. It took us less than 20 minutes – so quick & easy! These look good. I will have to give them a try. Thanks. We use the crockpot a whole lot. Hubby and his friends have card games and I end up cooking for them and the crockpot os my best friend! I llove the metball recipe, I might have to give that oone and try. I have been pulling together these types of recipes for a few weeks now. My daughter will be starting her third year of college in the fall and she, along with her two roommates, will be living off campus for the first time. All three girls are on the track team, so I’ll be helping her get the recipes together and frozen before school starts. I think this will be a great way for them to just pull out what they want, toss it in the crockpot, head off to class and track practice and dinner will be ready for them when they get home. Should be a money saving thing as well. Thanks for the tips! Haven’t tried yet but they all sound great. I love the idea of crock pot freezer meals. What side dishes are served with them? Typically crockpot meals are just that, the whole meal is inside the crock pot. Most meals though can be easily served with rice. Especially any chicken or beef dish. What sells me on this is the EASY part. 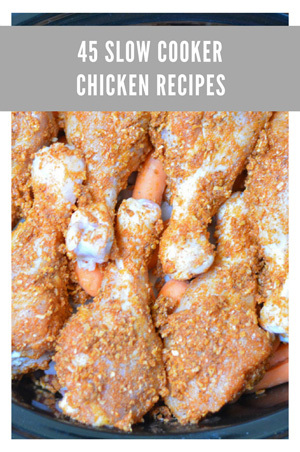 Many of the crock pot recipes I find have too many ingredients or too many steps – I need something that makes it super simple to throw together and most of these seem like ones my family would enjoy! Can’t wait to give them a try! Love love love these recipes! Thanks for sharing at Saturday Dishes!!! I am going to feature your site this weekend!!! Thank you so much. I love using my crock pot but haven’t taken it out recently. I will have to try some of these meals, like Pineapple Chicken Burritos. How super to freeze them like this. Thanks for the recipes. This is a good weekend project that will make the week days easier. Thanks for the new recipes. I started freezing crock pot meals in the early 90’s, as I worked a lot of long hours and it was easy to keep eating healthy with them. I am going to try a couple of your recipes, I haven’t done it in awhile, but some of these sound fabulous. This is such a great idea! I can’t wait to try. I just put all of these meals together in about 2 hours from start to freezer. Thank you so much! I love how you have frozen the bags flat for stacking. Great idea. These look so easy as well as delish – and may I suggest a slow-cooker liner for the easiest cleanup ever! I love those little suckers! Love these ideas thanks I will try some of these. I’m going to make these this weekend to keep stocked up! The only suggestion I have is a master grocery list for people wanting to make them all in one day. Thanks for the recipes! I am a single mom of 13 year old twin boys and this is just what I needed to make dinner time easier. Thanks so much for sharing this. Thank you for taking the time to share these recipes. After creating a master list of ingredients, shopping at local supermarket and assembling meals in freezer bags I had ten meals to put into freezer (3 hours total). The young working adults in my family had hot meals when they came home. They just had to remember to set crockpot up in the a.m. Such a success in our household, I just assemble another ten. It is our busy season at work and it takes only a minute to fill the crockpot, turn it on low. Delicious meals to enjoy! Thank you! Plan on trying another set of freezer crockpot meals. 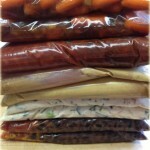 Can’t wait to try these 10 meals…..they look quick & easy…. Thank you for sharing your ideas.I will be trying these out. Love these ideas. I have a family of 8. 2 adults, 2 high school, 3 Jr High and a 3 yo. Think I’ll have to double or triple recipes… but anything to save time during the busy busy weeks! Can’t wait to try all these recipe. Thank you for sharing them. This has been great for my family. Easy prep on a Sunday and then just pop in a slow cooker for a meal ready at the end of the day. The meals are very tasty too! THANK YOU SOOOOO MUCH!!! I have tried about 6 of these so far and all of them have GREAT flavor! It has saved us so much time. My husband now looks forward to trying a new one each week! Thanks for the free recipes. I have looked at other websites and they are charging for the recipes. Thanks again for your help. Awesome! These look yummy. Have family coming into town for the holidays but I’ll still be working. These will save time and won’t have to come home and cook after a long day at the office. Thank you. Can’T wait. to try some! I have used these recipes before, and came back to get them again, but the southwest chicken chili is gone. Any way I can get it again?? It’s one of my favorites!!! Hi Stephanie, I’m not sure how it got deleted but it should be added back now. Enjoy!